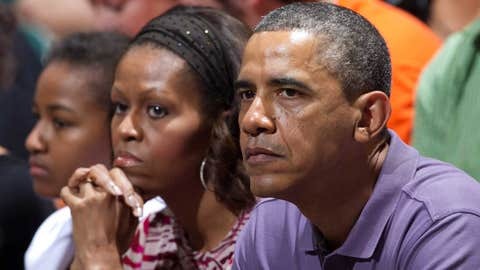 US president Barack Obama and First lady Michelle Obama take in Sunday's game. HONOLULU (AP) — President Barack Obama and the vacationing first family momentarily skipped the beach in Hawaii on Sunday to take in a college basketball game. US president Barack Obama flashes a Hawaiian shaka to the crowd at the end of the game between Oregon State and Akron at the Stan Sheriff Center. The First Family attended the game. Obama, first lady Michelle Obama and daughters Sasha and Malia attended the Oregon State-Akron game Sunday at the Diamond Head Classic tournament in Honolulu. Oregon State is coached by Michelle Obama’s brother, Craig Robinson. The Obamas sat just behind the Oregon State bench, with the president sitting in between his wife and friend Bobby Titcomb. The Obamas drew a standing ovation and loud cheers as they walked in to the small arena at the University of Hawaii. Fans took pictures while press photographers and videographers crowded an entrance to take pictures. Throughout the game, some fans ignored the action on the floor and watched the president instead. Obama high-fived fans as he walked off the floor at halftime and the end of the game. 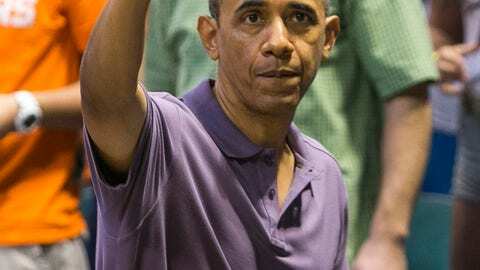 Obama is a noted basketball fan and recreational player. Oregon State was 4-0 with Obama in attendance until Sunday. Akron raced to a 10-0 lead and beat the Beavers 83-71. The arena beefed up security because of the president, screening players and cheerleaders and their belongings with metal detectors in the hours before the tournament tipped off.